UPDATE: Currently running the game through WTFast using the default listed game of BnS causes problems with the patcher since they(wtfast) have not updated the game parameters after CBT. So, till they release an update for it, you can use the below method to allow you to run it correctly. Just making this topic to set up BnS for wtfast since they havn't added the game yet to their list. Anyways, there's not much to do. 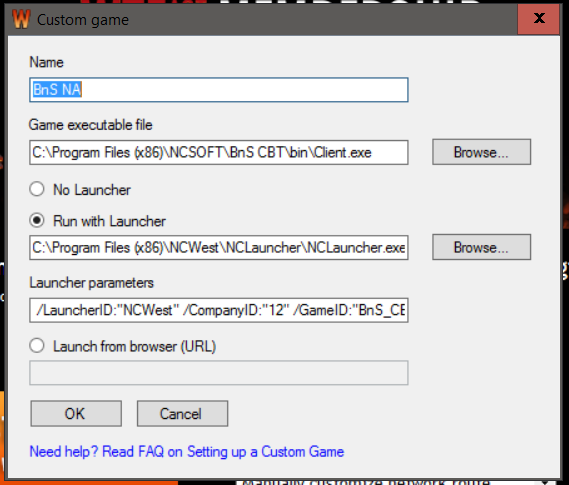 Just select the custom game option and click on "Add"
Launcher parameters: /LauncherID:"NCWest" /CompanyID:"12" /GameID:"BnS" /LUpdateAddr:"updater.nclauncher.ncsoft.com"
Nice guide thank you for sharing I might take notes if I decide to use wtfast atm I'm having 80-100ms.